I am fairly sure that I would stop and stare - for a very long time! "Kinetic Rain" Changi Airport Singapore from ART+COM on Vimeo. I'll have to leave time if I ever travel through this airport! It has been quite awhile since I've posted on the blog and for good reason. Marji and I have just returned from a 7 week road trip exploring America. We left on September 5th with few specific plans but several broad goals. 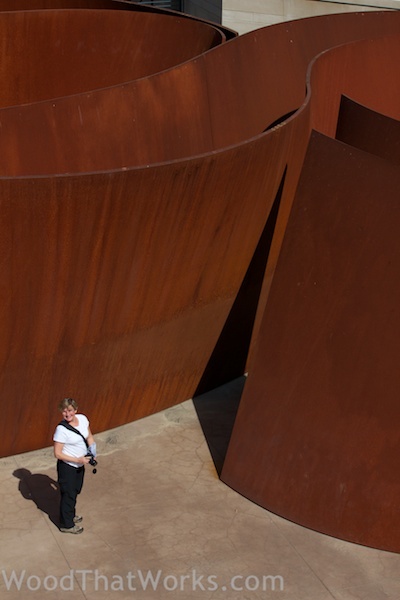 One of those goals was to experience any sculpture parks we traveled near. Some folks collect baseball parks, others national parks. We collect sculpture parks. The quest was inspired by our frequent visits to both Storm King Art Center (Mountationville, NY) and Grounds for Sculpture (Hamilton, NJ). 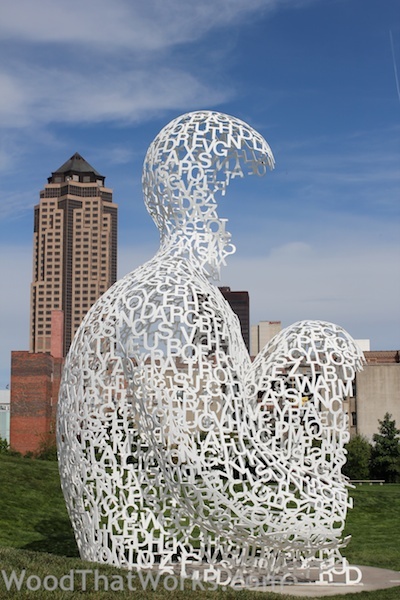 We started with a Google search that ended at a Wikipedia article listing sculpture parks around the world. We concentrated on the USA for this trip! The first park to cross our path was the Scandaga River Sculpture Park in Wells, NY. It was in a remote area near the Adirondacks and we had our doubts as we followed the GPS. But it led us to the beautiful garden of artist John Van Alstine and his studio. It was our lucky day because the artist was home. We had a delightful visit. John told us of a recently published book by Francesca Cigola titled Art Parks: A Tour of America's Sculpture Parks and Gardens, and recommended it as a resource for our travels. We located it on Amazon and had it waiting for us at a friend's home as we passed near Pittsburgh.We used it extensively and adjusted routes to view the parks shared in this book. It directed us to a wide range of parks and wonderful sculpture across America. We saw very little new kinetic work (more info later), but many exciting sculptures. The book was helpful in locating some extremely interesting parks. Be sure to cross reference things with online resources because some have restricted viewing. Of note, the northeast has the highest concentration of sculpture parks by far and we never knew about a host of them. We didn't visit any of those because we can see them as day trips from home. We have some interesting weekend trips ahead! Here is a quick overview of a few of our discoveries. Our trip was exciting on many levels but especially because of the art we saw, both natural and man made. I will continue to share additional information about the various sculptures parks we visited across America in future blog posts. Check back regularly. You might discover a place you need to visit! Some of our favorite places to visit are sculpture gardens including Storm King in NY State. We have started collecting ideas of other places to visit through recommendations and web searching. This is how we stumbled upon The Singing Ringing Tree in England. Someday when we make our way back to Europe this will certainly be on our list of places to visit. Have you seen The Singing Ringing Tree in person? What were your thoughts? There are many sources of inspiration within the world of art. Here is an interesting use of sculpture and video to present motion and to capture people's interaction with the sculpture. sculpture and moving through Melbourne's landmark location throughout the day." The animation of MÖBIUS took place over two weeks on Friday, Saturday, and Sunday between the May 6th and 20th 2011. Here is the video of the making of the animation video. The process is quite fascinating. The still pictures of the MÖBIUS are also quite striking with their geometric forms and creation of interesting spaces.